I recently bought the new Gillette Venus & Olay razor and wanted to share this with you. I scored it half price at Superdrug so it cost around £5. £10 is a bit pricey for a razor especially when you only get one head. I think they need to throw in another for us to feel like we are really getting value. 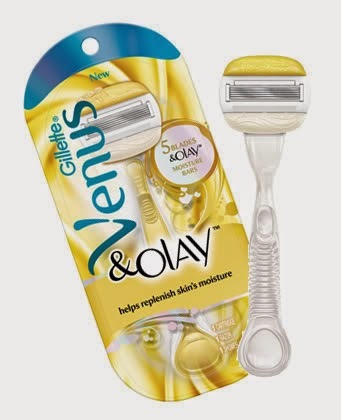 Although I have used Venus razors in the passed and been really happy with them so when I saw that they had added Olay my legs were screaming to be silky smooth. First impressions of the packaging was really positive. Bright and fun looking the golden colour makes me think of sunshine and I am sure my pack had some sparkle on it to lure me in. We all know it is what's inside that counts though. The head sports 5 blades for a close shave. The Olay is featured in the moisture bars which claim to leave skin feeling moisturised and smooth instead of dull and dry like most shaving can. This is where things get real. When I first used this razor the Olay bar fell straight off which was a massive disappointment. Had I paid full price I would have been really annoyed as otherwise I would have bought a regular Venus razor. 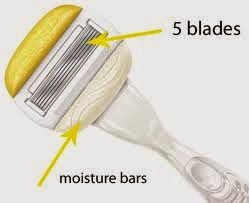 Who knows maybe I was unlucky but I will say it has put me off buying the Olay head as a replacement for this razor. The razor itself is really good and when I use Venus I never end up cutting myself even when used in a rush so I would recommend the regular Venus. Have you used the Olay did you have the same problem? Wow. That's a real shame - especially when you're paying £10 full price for one of those! !